Scrap low reps and shock your biceps and triceps into max growth with this 100-curl challenge. Everyone has their own reasons for wanting strong, defined arms. After following this 100 curl arm plan, not only will your arms look good, you’ll also be stronger. Don’t worry if you’ve never lifted a dumbbell in your life. This arm challenge was designed with everyone in mind! Whether it’s your first time working out or you’re at the gym on a daily basis. Below is an explanation of how to do each of the exercises. Choosing the appropriate size weight is key here — you want one that fatigues your muscles by the end of the sets. If the challenge ever feels too easy, that’s your cue to increase the weight of the dumbbells (and if you find you are fatiguing too early, decrease the weight amount). So, pick a pair of dumbbells you can curl for 20 reps at a moderate difficulty. Your aim is to complete 100 biceps curls. Every time you need to rest, drop the dumbbells and perform 15 close-grip press-ups. So, really, there’s no rest. Mind you, we never said it would be easy. 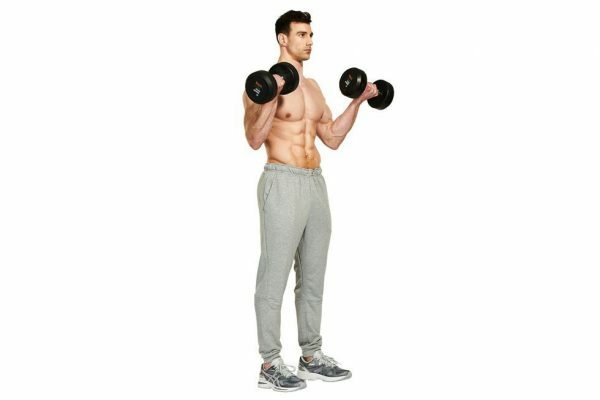 Hold two dumbbells by your sides, palms facing in. Curl both weights up towards your shoulders, rotating them as you lift, aiming to get your pinky fingers as close to your shoulders as you can without letting your elbows move forwards. 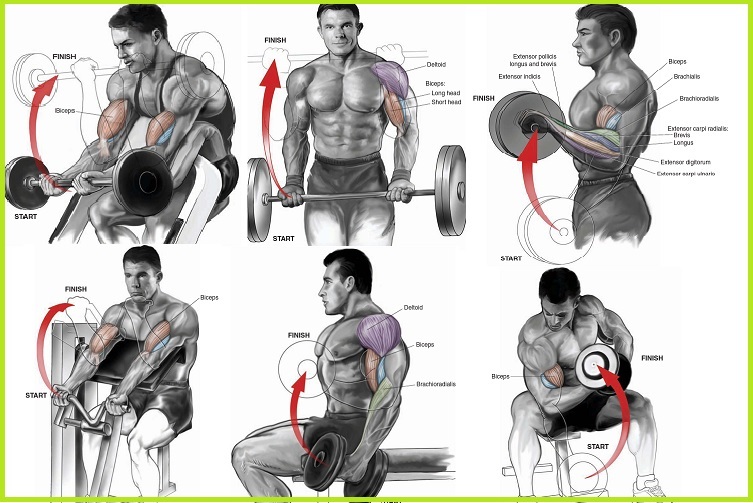 Squeeze your biceps hard at the top, before slowly lowering and flexing your triceps hard at the bottom. When your biceps need a break, drop to the floor and assume the top of a press-up position. To switch the emphasis to your triceps, bring your fingers and thumbs together to touch, so your hands form a diamond shape directly below your lower chest. Lower your body to the floor, keeping your elbows tucked in. When your chest hits your hands, explode back up. That’s one rep – 14 more to go. Don’t go hard with the curls too fast. You may fit in more reps at first, but fatigue will catch up with you. Once the reps drop, the press-ups will mount up. But go too slow and the press-ups will wipe you out. Instead, maintain a steady pace and rest only when you can no longer control the lowering of your curls. Good luck getting your arms back in your shirt.